Available in stores now, our Seasonal Honey Orange Bread will delight your taste buds with a hint of orange zest and honey. We’ve experimented with a few recipes that will make a satisfying breakfast or an impressive dessert. 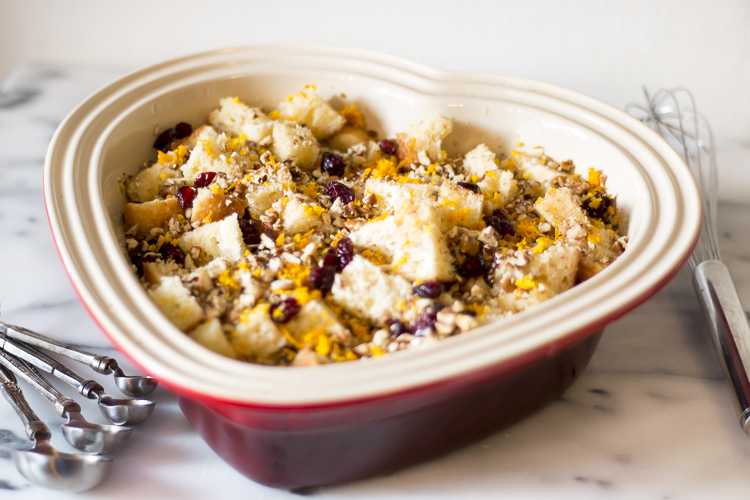 The sweet honey, orange, and dried cranberries play well with the nutty texture of the pecans in our Pecan & Dried Cranberry Honey Orange Bread Pudding. 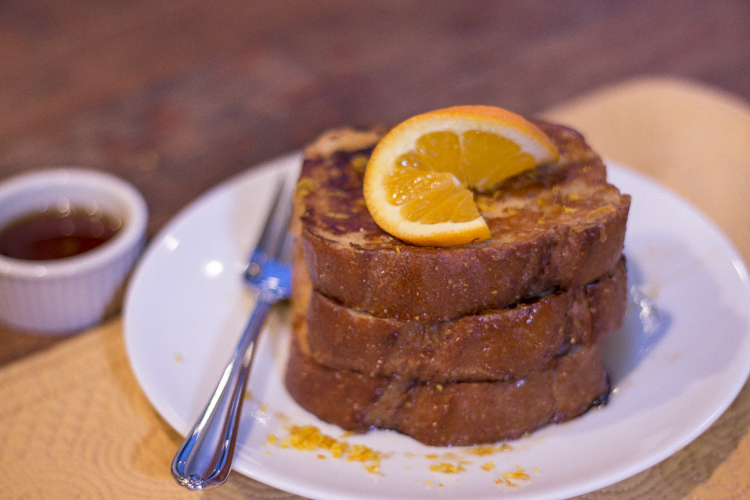 The orange zest is an appreciated ingredient in our Honey Orange French Toast. 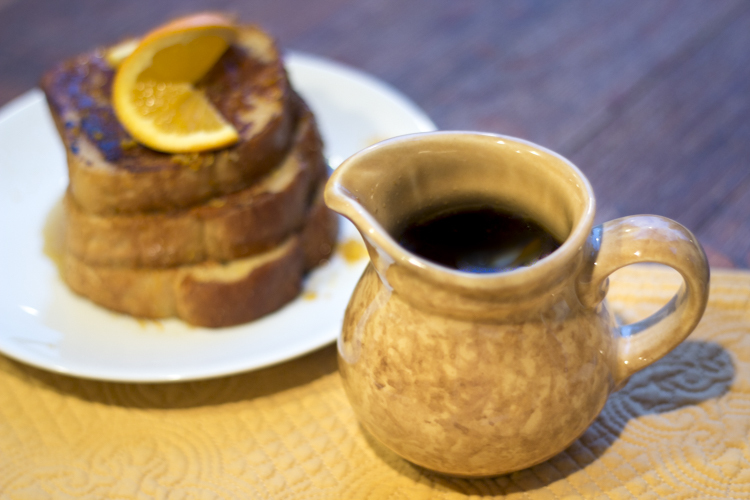 We’ve topped that off with Honey Orange Syrup, which will take the place of your usual maple. We also played around with the idea of what kind of sandwich would go well with this bread. I can’t seem to get brie and bacon out of my head. Something about the sweet and savory of that combination. Maybe something with herbs. Do you have ideas? Share them with us here. 1. Cut Honey Orange Loaf into 1/2 – 1 inch cubes and spread out in a baking dish. 2. Wisk eggs, milk, vanilla, and sugar in a bowl or combine in your mixer. 3. Pour mixture over bread cubes. 4. Sprinkle on dried cranberries and toss within bread cube, then top with diced pecans. 5. Bake in a 325 degree oven for 60 minutes or until top is crispy and brown. 6. Remove from oven and allow to cool slightly. Enjoy immediately. Vanilla ice cream would be divine with it. 1. Combine eggs, vanilla, milk, honey, orange zest, and cinnamon in a bowl with a whisk. 2. Heat butter or non-stick spray in a frying pan over medium heat. 3. Dip a slice or two at a time into egg mixture, allowing excess to drip off before placing in the frying pan over medium heat. 4. Lay the coated bread slices into the frying pan. Cook until the French toast is golden brown, about 3 minutes per side. 1. Combine honey, orange juice, water, vanilla, and orange zest in a sauce pan. 2. Stir over medium, stirring occasionally, allowing to simmer for 20 minutes. Watch closely so it doesn’t burn. 3. Pour into a glass container and allow to cool. 4. Use as a topping as you would with maple syrup. 5. It may be stored in a container for later use. Our Seasonal Honey Orange Bread is definitely a one of a kind. Eat it fresh out of the bag, toast it, or make something with it. We enjoyed the bread pudding for dessert and then again for breakfast the next morning. The French Toast was easily refrigerated or frozen then reheated in the toaster oven. We’re storing the leftover honey orange syrup in a mason jar for safe keeping until we’re ready for French toast again.